It was wrapped in some black paper tied together with a sticker of their logo and a pretty pink bow! Already just from looking at it I was so excited to see what lay beyond the paper. 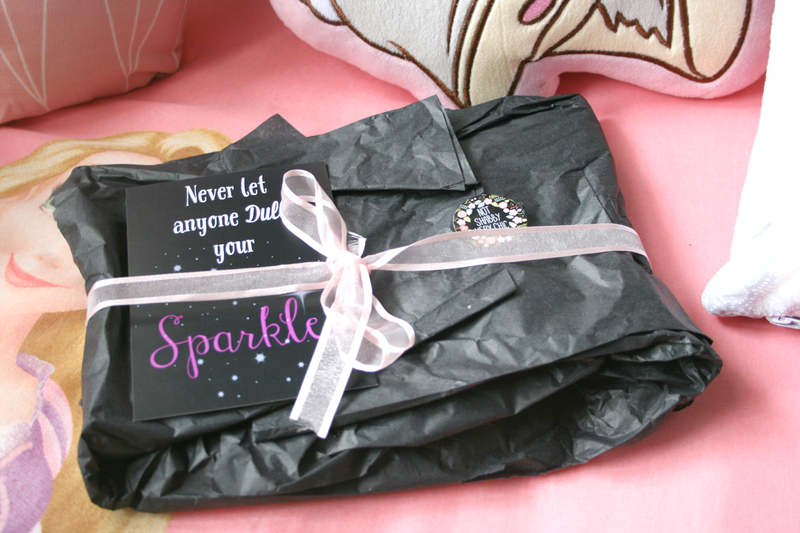 But before opening it placed on top of the paper was a postcard sized quote of 'Never let anyone dull your sparkle' which as soon as I had taken pictures of it went straight onto my wall because I just adore it. Then of course like an excited child on Christmas I opened the paper up as quickly as I could and was so excited about all the contents inside! 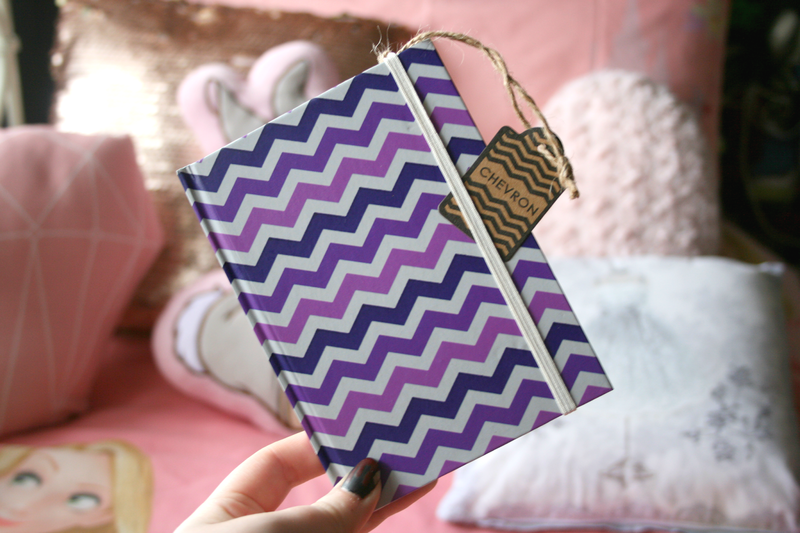 Firstly inside was a Purple Chevron Hardback Notebook which as a blogger I'm sure you can understand my excitement and I started using it straight away. It's currently the notebook I use to write all my blog post ideas in and as it's the perfect size to put in your handbag I constantly have it with me as you never know when you might get a good idea. The next thing I picked out I am so in love with for two reasons, the first being that it keeps your hands warm and the second because of how adorable and pretty it is. The You & Me Handwarmer is something that is going to be perfect for the colder weather as to activate it you simply click the metal circle and it heats up within seconds. It's perfect for just putting inside your coat pocket to have and then when you need it, it's there. Also how absolutely gorgeous is it's little knitted cosy, honestly it's so pretty I'm in love with it and would love a larger water bottle cosy just like it! November and December for me are the Hot Chocolate months as there's nothing like a hot drink on a cold evening, so I was super excited for the fact that there was a Malteasers Hot Chocolate Sachet inside and as you can imagine it tastes pretty darn good! To accompany your hot chocolate MORE CHOCOLATE! Inside the Treat Box were two Pink Chocolate Stars topped with popping candy which were amazing and if I could buy a box of them I would. I absolutely adored the presentation of these stars as attached to their little packet was a tag held together with two gold sparkly pegs with the words 'Eat Me' on the label, very Alice in Wonderland themed which is one of my all time favourite movies so I definitely got excited over that! Also the pegs are so adorable and I'll definitely be re-using them. Also inside the Treat Box was a Pocket Mirror which I find so handy to have inside my handbag for when I'm out and about and want to check my makeup or do a touch up. 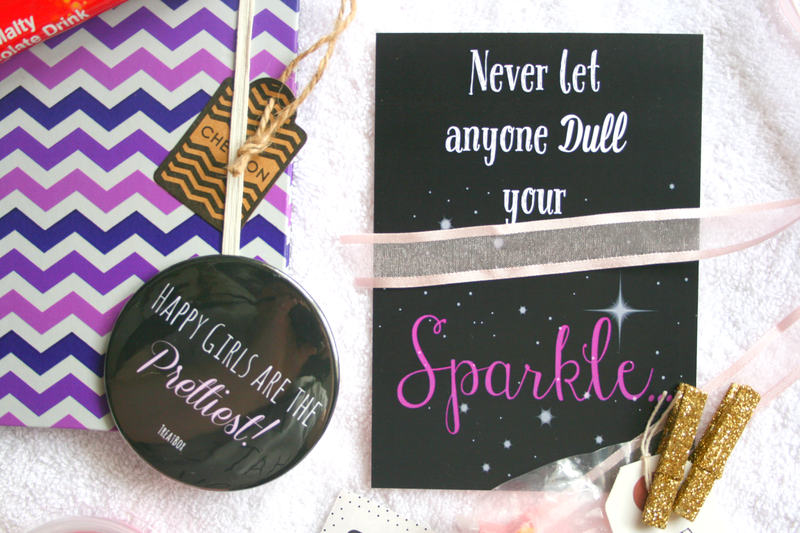 Also printed on the back is the quote 'Happy Girls are the Prettiest' along with Treatbox which I thought was such a lovely little touch! 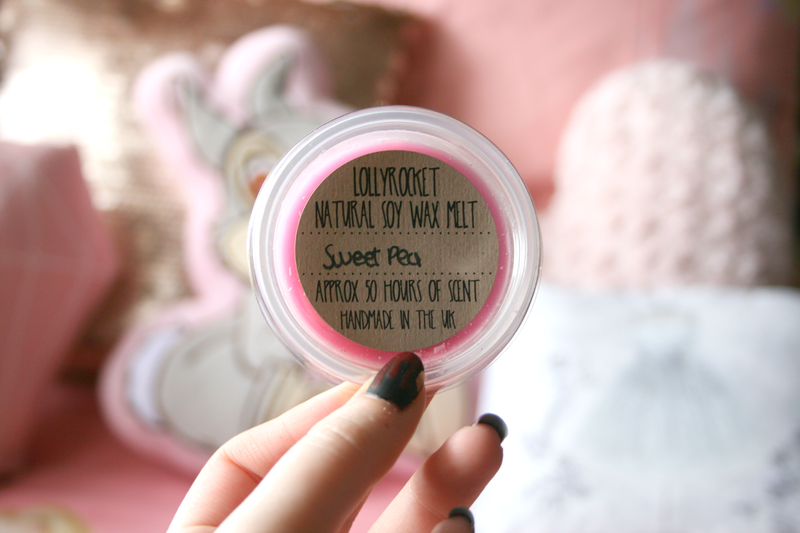 Another thing I love in the colder months are candles and wax melts and oh my goodness the LollyRocket Natural Soy Wax Melt in 'Sweet Pea' smells amazing! It states that you get approx 50hrs of burning time from this which is great as I never want the scent to leave. When lit it's pretty strong and you can smell it all around the house which I really like as the scent is so lovely it instantly puts a smile on my face! Finally inside were a pack of four Notelet Envelopes which are honestly one of the most adorable inventions I've ever come across. 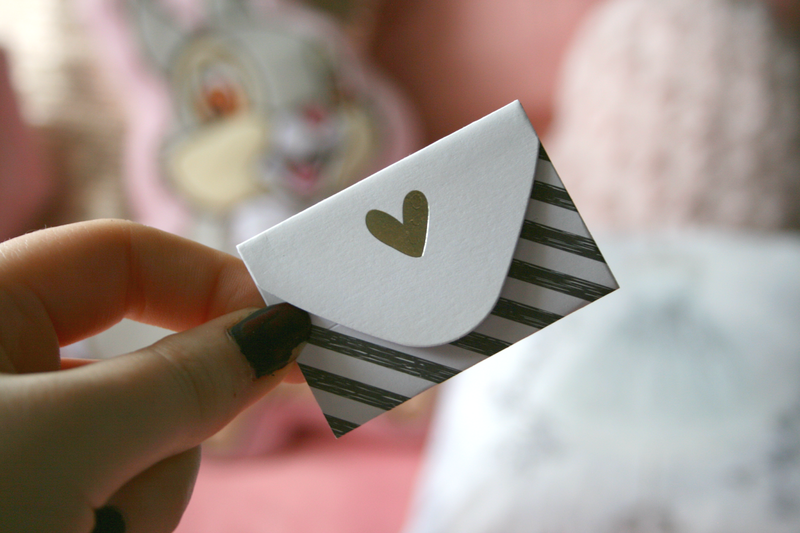 They are basically tiny envelopes with a quote already printed on the front that open up to be a little page for you to write something on, then it simply folds back into an envelope and I just cannot get over how dainty and cute they are! 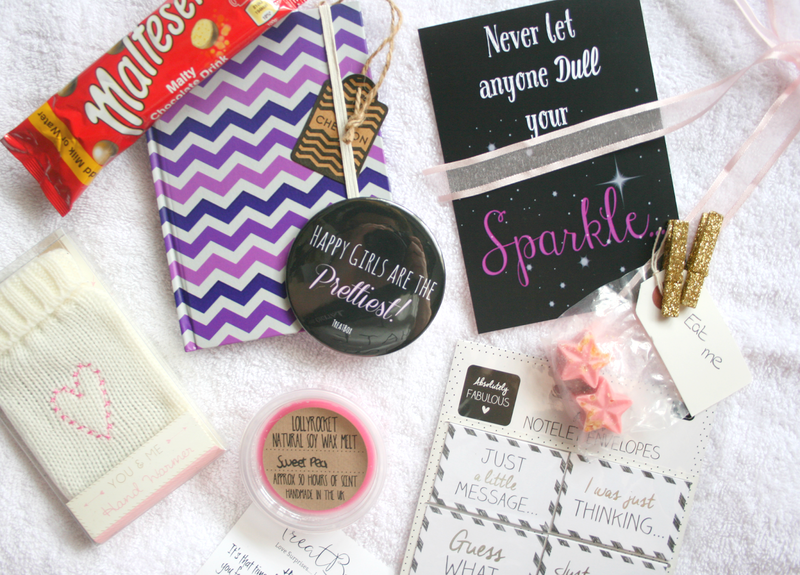 I'm so in love with the cuteness that is this subscription box and think it's well worth the £12 - £14 price tag. 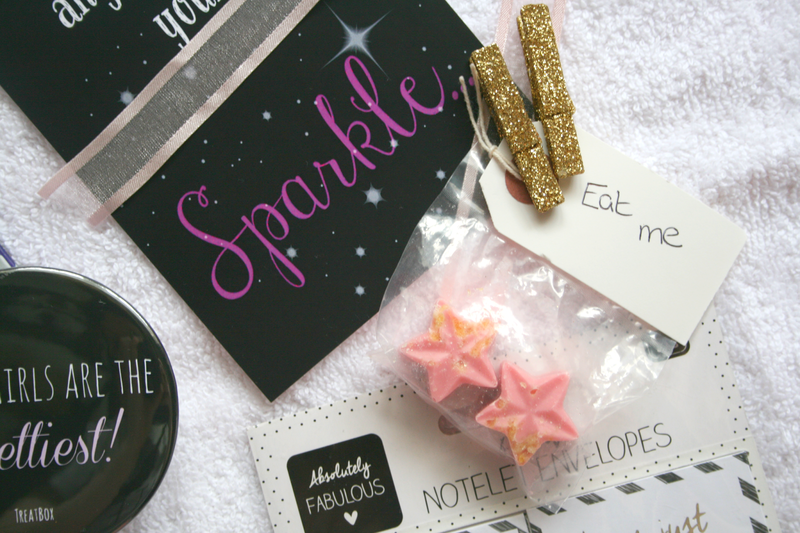 If you'd like to find out more or subscribe to Not Shabby Very Chic's Treatbox you can click here! What do you think of the Treat box? This looks like such an amazing sub box, I really find myself disappointed by the beauty ones! This seems like an amazing subscription box and those little pegs are adorable! Definitely checking this out. Adorable, I love the notebook! Looks so adorable!!!! I love every single detail!! Thank you for all this amazing information about the wax burner and i also got many information about it well done.